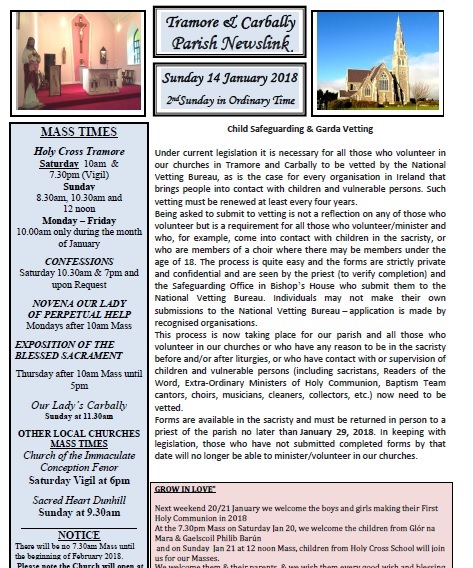 Under current legislation it is necessary for all those who volunteer in our churches in Tramore and Carbally to be vetted by the National Vetting Bureau, as is the case for every organisation in Ireland that brings people into contact with children and vulnerable persons. Such vetting must be renewed at least every four years. Being asked to submit to vetting is not a reflection on any of those who volunteer but is a requirement for all those who volunteer/minister and who, for example, come into contact with children in the sacristy, or who are members of a choir where there may be members under the age of 18. The process is quite easy and the forms are strictly private and confidential and are seen by the priest (to verify completion) and the Safeguarding Office in Bishop’s House who submit them to the National Vetting Bureau. Individuals may not make their own submissions to the National Vetting Bureau – application is made by recognised organisations. 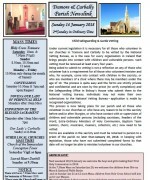 This process is now taking place for our parish and all those who volunteer in our churches or who have any reason to be in the sacristy before and/or after liturgies, or who have contact with or supervision of children and vulnerable persons (including sacristans, Readers of the Word, Extra-Ordinary Ministers of Holy Communion, Baptism Team cantors, choirs, musicians, cleaners, collectors, etc.) now need to be vetted. Forms are available in the sacristy and must be returned in person to a priest of the parish no later than January 29, 2018. In keeping with legislation, those who have not submitted completed forms by that date will no longer be able to minister/volunteer in our churches.